“The Divine Service is the chief duty of every monastic family. It is the principal work prescribed by the Rule of St Benedict, and nothing is to be preferred to it. It is our raison d’être. It includes the Holy Sacrifice of the Mass, and Adoration of the Eucharist and the Liturgy of the Hours chanted in community seven times a day”. Rule of Life of the Tyburn Congregation. I first encountered something of the meaning of a monastic timetable when I was a schoolgirl sitting on the benches of a convent school. Hanging near me on the wall, like a radiant sun, was what we called our Mass Clock. It had 24 brilliant wedges of colour. A ring of 24 around the outside, indicating the hours of each day and each night, and a jewel-like wedge of colour joining each hour to the centre inscribed with the names of all the countries in the world where the Sacrifice of the Mass was being said, and linking them to our local time. Beneath the Mass Clock were written the words of the prophet Malachi: “From the rising of the sun to its setting my name will be great among the nations, everywhere a pure oblation will be offered to my name. Thus says the Lord”. It was simple. Sitting in an ordinary classroom doing our sums we found that with a short prayer and a moment of silence, we could unite ourselves to a spiritual activity going on somewhere else in the world, and at each hour be caught up into this magical world of the Mass Clock. The angel became my close companion. He became a sign for me of the hidden adventure whereby the locked barrier of time with its closed circle of repetitive activities could be dissolved and my spirit carried on this angel’s invisible wings to eternal realities and the mysterious wonder of heaven. This angel came to me at night also, when I was awake, and the dark silent hours slid by in an act of worship which was joined together with Christ’s Mass sacrifice being then offered somewhere else in the world. So it is in my monastic timetable. The Mass is this Sun of my life which daily and hourly dissolves the darkness of time and illuminates the splendour of eternal realities. 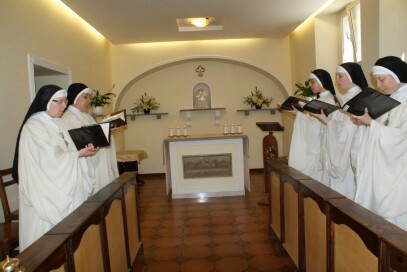 Our monastic community sings with all its skill our hymns of praise to the glory of God and intercedes for the poverty, pain and needs of all humanity. In our monastic timetable, time and history are only the outward aspect of an inward, hidden, spiritual activity which joins earth to heaven, time to eternity, humanity with God, as seven times daily we join company with these angelic messengers in their to-ing and fro-ing from heaven to earth and from earth to heaven, mystically engaged in the secret commerce of the world’s salvation.